Eliminate your exposure to toxic solvents with Fabtech Systems’ +PLUSeries Solvent Replacement Wipes. +PLUSeries® Solvent Replacement Wipes are specifically designed to replace the use of acetone & other toxic solvents in your work environment, greatly reducing your exposure to harmful toxic chemicals. We all know it’s recommended to wear protective gloves in our professional O & P environment. But those of us who work in busy labs know that mistakes do happen. However, year after year of “occasional exposure” to toxic chemical solvents can build up in your system with potentially harmful results. 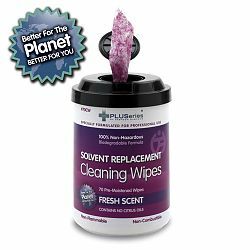 +PLUSeries® Solvent Replacement Wipes offer a unique chemistry not available with conventional solvents or citrus based cleaners. We use a special dual textured non-scratching towel pre-moistened with our special formula. This design contains NO pumice or other abrasive materials that can scratch and dull the surfaces. You no longer have to worry about damaging your workspace surfaces or finished projects. Our biodegradable formula is powerful enough to instantly remove dirt, permanent ink, resins, urethanes, paint, dyes, oil and grease and many types of adhesive. Simply wipe it all away! The wipes contain no harsh citrus solvents or alcohols that can react with some surfaces. Plus, they have a fresh scent and natural beeswax emollients to enhance moisture retention. you used to use Acetone on! dirt, paint, oil, epoxy resin, polyester resin, adhesives, permanent Ink, dyes, stains, grease, tar, glue, adhesive backing, urethanes, paint and pigments, plus much more!